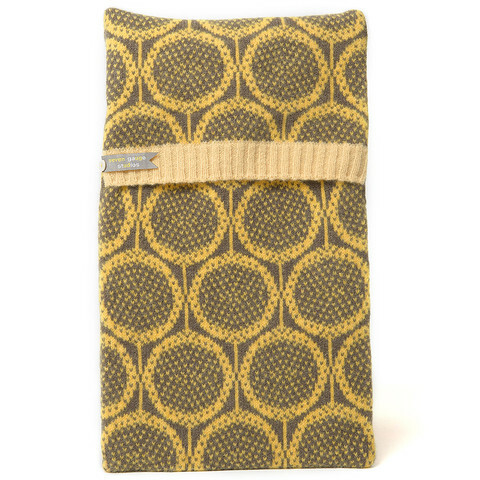 The cold winter nights are still with us and one way to warm up is with a hot water bottle. Who wouldn’t love a cuddle with one of these? The warm tones of the Seed hot water bottle from Seven Gauge Studio (pictured left) alone will spark an inner glow. Each cover is knitted on a hand-powered machine from top quality lambswool, then individually washed and slightly felted for a softer cuddle. They are priced at £45, including the bottle, and made to order in England. The hottie covers from Laura’s Loom (pictured right) are made from Bluefaced Leicester wool that is sourced from the Yorkshire Dales. The lovely colours of these Howgill fabrics deliberately evoke the colours and textures of Britain’s northern landscapes. All Laura’s Loom products are designed, sourced and made in the UK, proudly celebrating Britain’s woollen heritage. 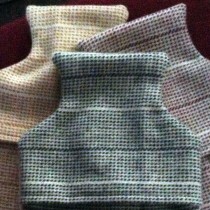 The hotties are available in the three colours shown, priced £24, and fit a standard 2l bottle (not included). An upcycled alternative, is the selection of hot water bottle covers made from vintage Welsh blankets that have been damaged beyond repair available from Jane Beck. The blanket remnants are salvaged to make limited numbers of mini and full size hot water bottle covers. Prices from £19.99 for a mini hottie, with bottle included. 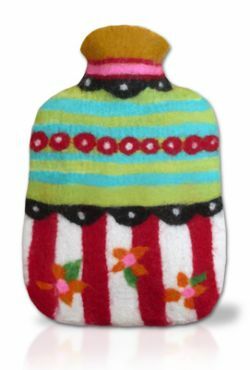 For a homemade option, the Hottie Bottie hot water bottle cover felt making kit from Gilliangladrag includes the wool tops, ready cut plastic template and full step-by-step feltmaking instructions written by Gillian Harris, author of “Complete Feltmaking” and “Carnival of Felting”. A basic felt making kit (bamboo mat and net) is also required. I am quite tempted to sign up for a Learn to Felt course, £65 for the day at the Fluff-a-torium in Dorking. 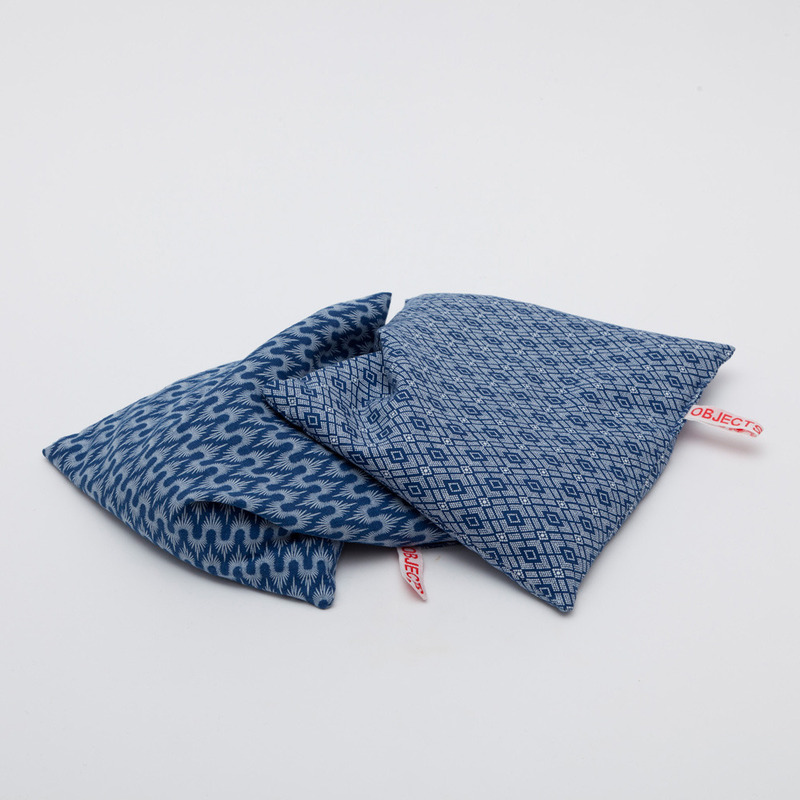 The cherry stone bag from Momosan is an original, and understated alternative to conventional hot water bottles. The 100% African cotton bags are filled with cherry stones that are a by-product of jam and kirsch making. Apparently, Swiss distillery workers traditionally heated bags of the stones on warm stoves to sooth bumps and aching muscles. If you don’t have a stove to hand, you and I can heat the cherry stone pillows in the microwave to soothe muscular tension or warm feet in bed. The bag can also be chilled for use as a cold compress on sprains or headaches. The bags are available in 9 different patterns and cost £22. Nights need no longer be chilly! All pictures are from the suppliers websites.